Hi, Lois here with something other than a card today. Some time ago I bought some tags at Hobby Lobby and have yet to use them. 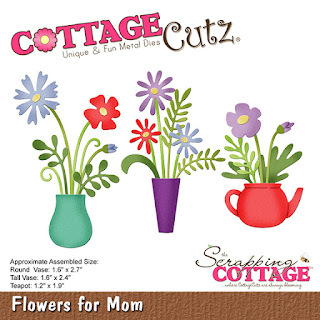 Today is the day I pulled them out to show off another one of the newly-released Mother's Day release at CottageCutz, Flowers for Mom. I started by cutting all the die pieces from a scrap of white cardstock. Because I wanted a variety of colors on my tags, I thought white would be the way to start. Using many Copic markers, I colored all the pieces. I constructed all three flower arrangements, using the die packaging as my guide. I took out my three tags . . .
. . . and using sponge daubers, added some color around the edges of the three tags, matching the color of each pot/vase. I strung some baker's twine through the holes of the tags and glued on the flower arrangements. Here again are my three tags. This was a rather quick and easy project. Love your tags Lois! The inking adds so much dimension and your die cuts look amazing! Great idea to make tags! So cute! Great idea to use these on tags - so versatile!